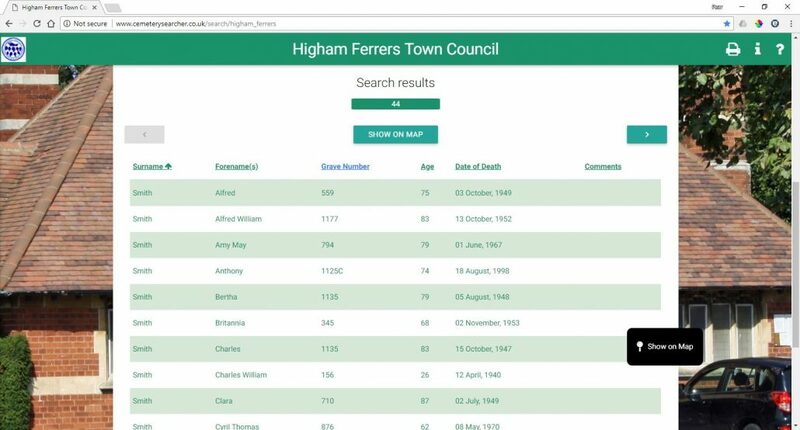 Higham Ferrers Town Council needed a digital mapping package to help map assets, plan events and help with cemetery management. 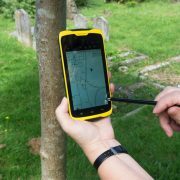 After purchasing Pear Technology’s mapping software and services the council is now able to quickly and easily search burial records and create maps. The historic market town of Higham Ferrers in Northamptonshire, has a population of around 8500 and has long links with the Duchy of Lancaster, who still owns considerable land holdings in the area. 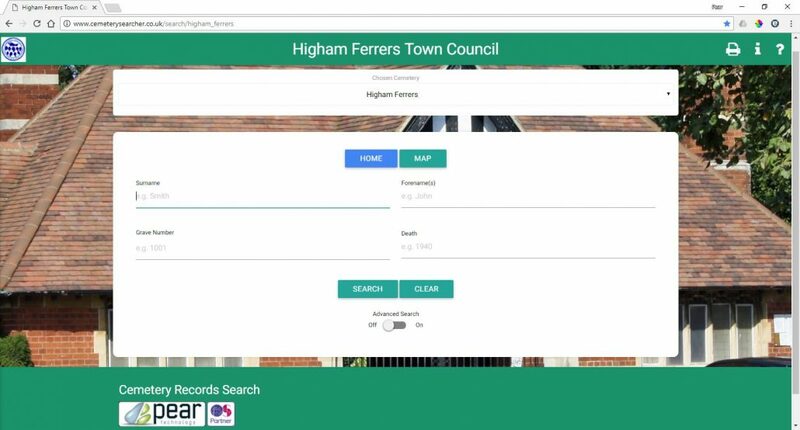 The Town Council was created in 1974 and is the successor to Higham Ferrers Borough Council. Sandra Mitcham has been the Town Clerk since 2011 since joining the Council, having previously been the clerk in her home village of Needingworth. The original paper cemetery map was inaccurate, now the digital map is correct and burial records are reliable and easy to search. 45 minute burial record search time reduced to 5 minutes. Cemetery Searcher enables the public to search the burial records online and locate a grave on the map at any time. 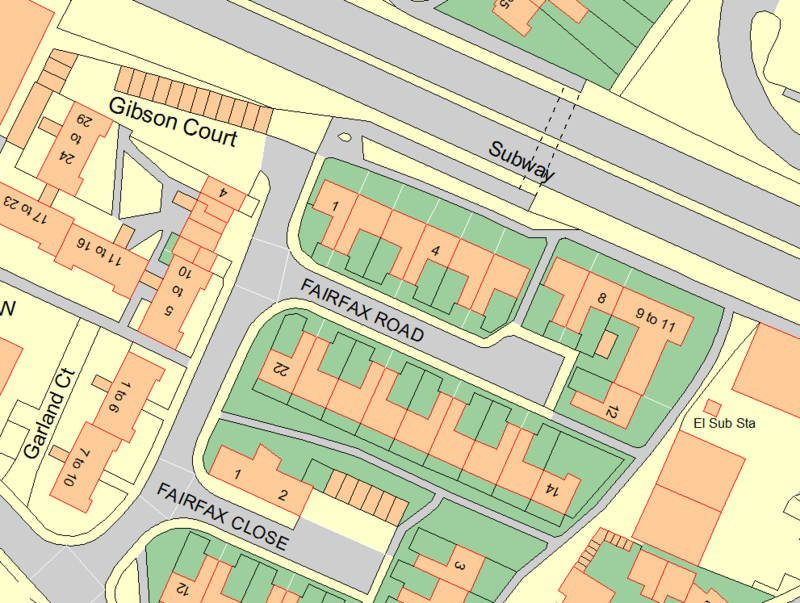 Event maps can be produced and council owned land titles are now easily accessed using PT-Mapper Pro and PT-MapLink. One of the council’s main concerns was the condition of their existing paper cemetery map. 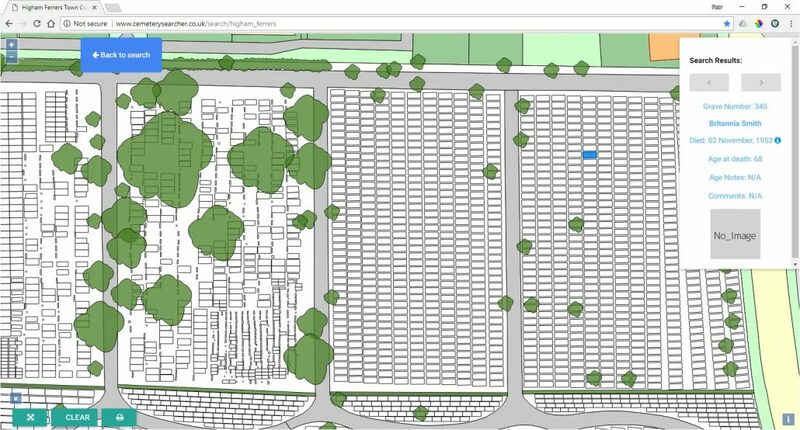 The original paper cemetery map was not to scale and the council were concerned that, as space was running out, they needed to be able to know exactly what could be accommodated. Additionally, the inaccuracy of the original cemetery map meant that each information request required a visit to the cemetery and took around 45 minutes to resolve. 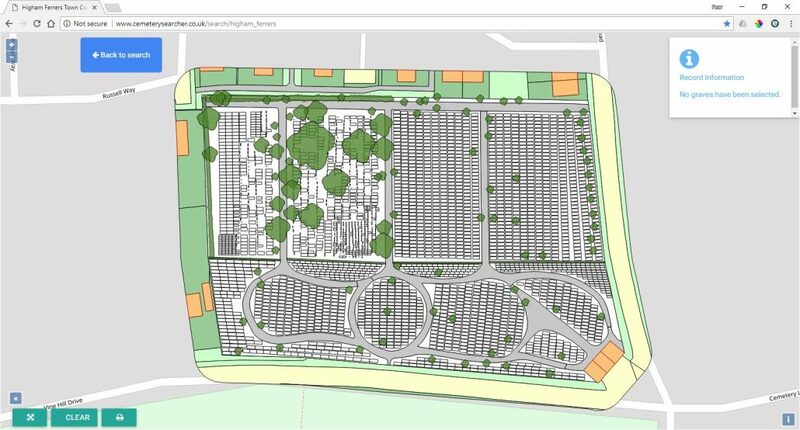 Following a free demonstration of the software in action the Town Council decided to purchase Pear’s mapping package for use with cemetery, asset and event mapping. Pear Technology helped sign the council up to the Public Sector Mapping Agreement (PSMA). 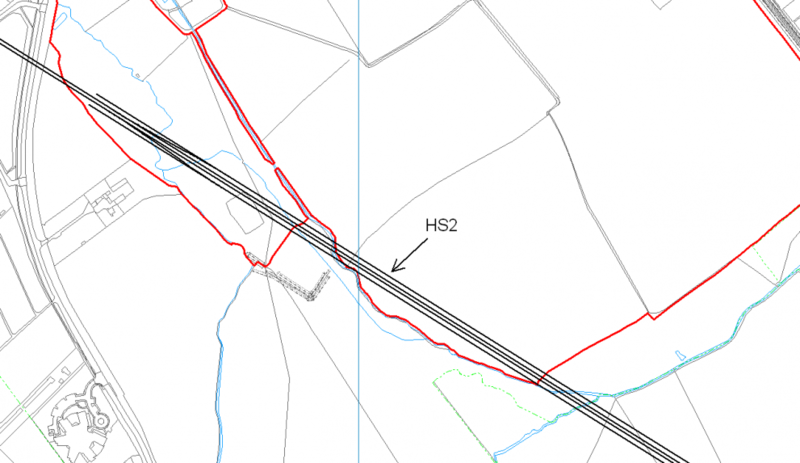 This is an agreement between the Government and Ordnance Survey that entitles organisations in the public sector to free map data. If the council purchased this map data it would cost over £700 per annum. 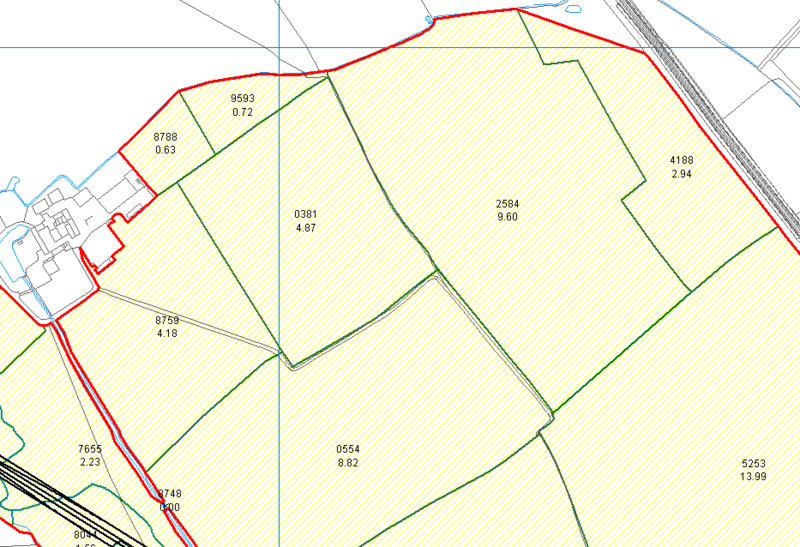 The OS MasterMap Topography Layer map data was cut to the parish boundary and converted into a format compatible with PT-Mapper Pro, Pear’s map editing software. 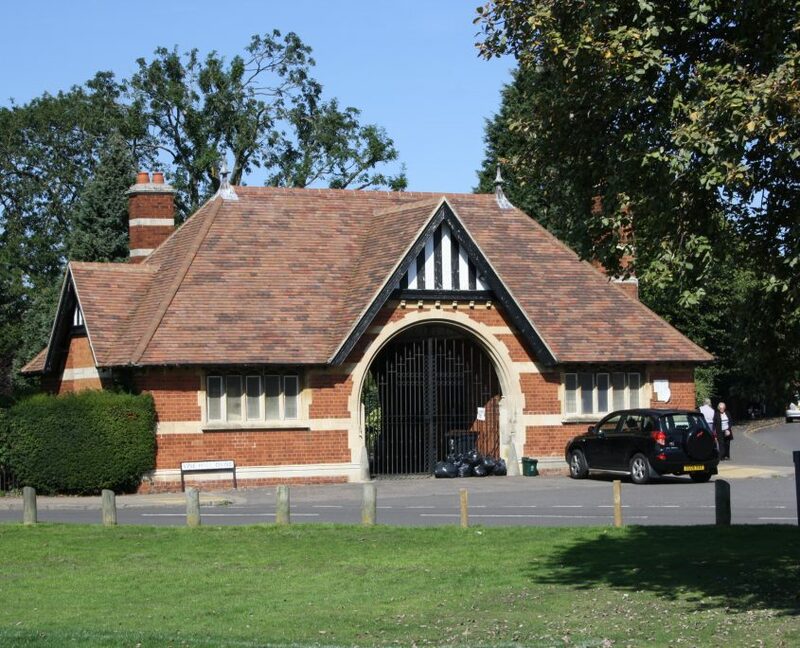 This enabled the council to use a digital map of their town for council meetings, event planning and asset management. Using a combination of the OS data, photographs of the original maps, and Google Earth, Pear produced the first draft of the cemetery map. Any queries we had were marked on the map in red for Sandra to investigate. 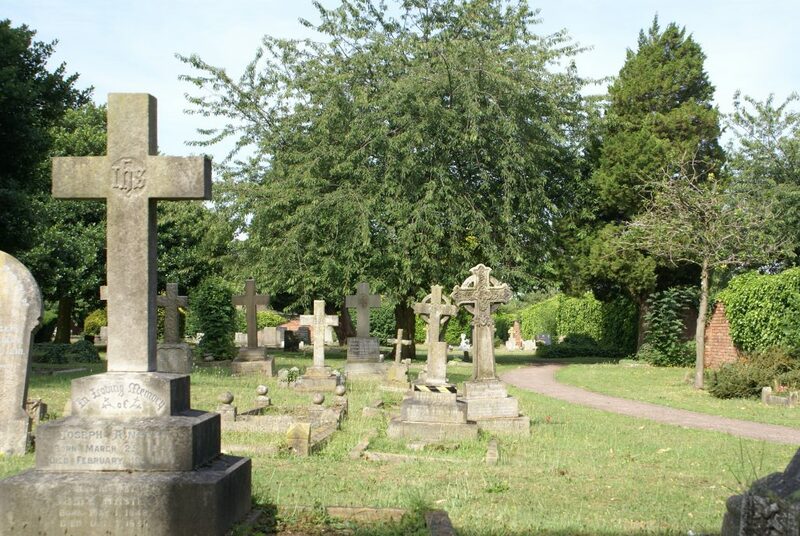 Realising that they needed more information as a result of some of the inaccuracies highlighted by the mapping process, the council commissioned a survey of certain areas of the cemetery. Pear then imported the data provided by the surveying company into the digital map. 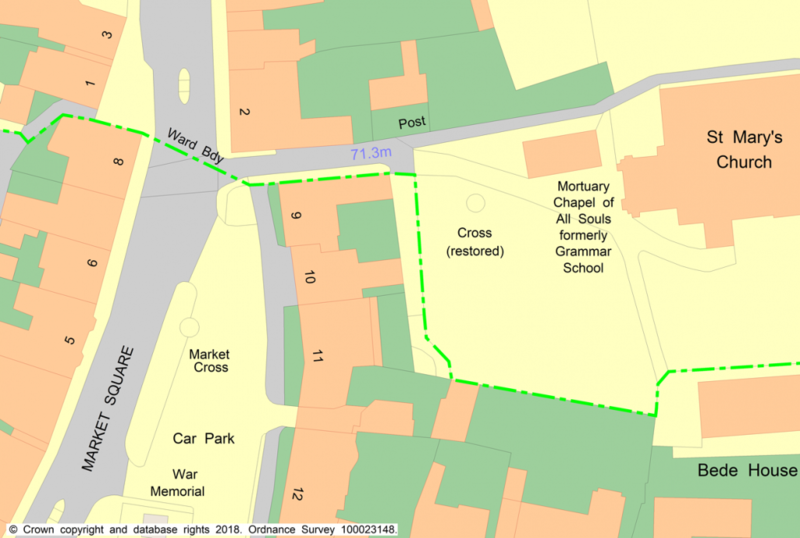 Once the final amendments had been completed the map was linked to Pear’s Cemetery Database software using PT-MapLink. This allows users to easily locate existing burials or add new ones either through the database or by clicking a grave on the map. 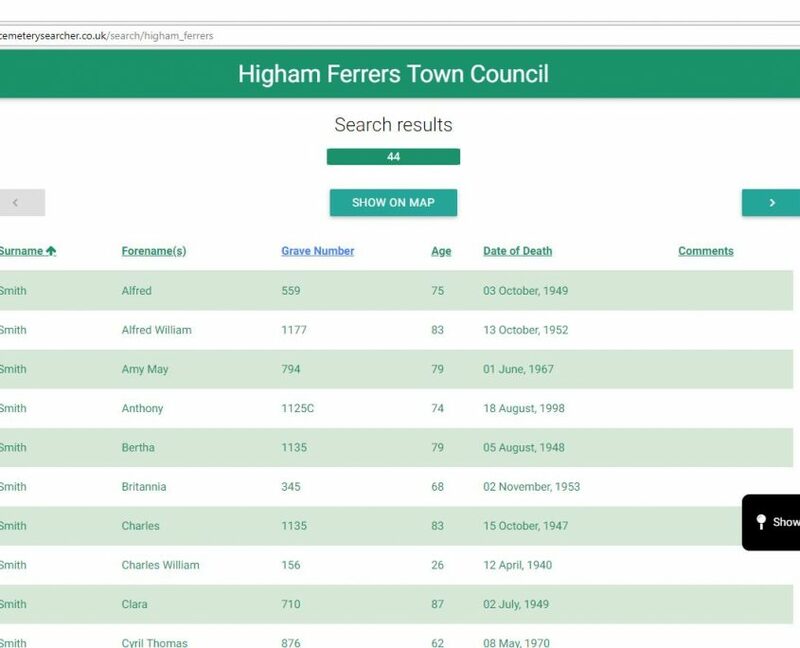 In 2017 Higham Ferrers Town Council were the first council to purchase Cemetery Searcher, Pear’s new online cemetery search facility. It allows members of the public to search burial records for loved ones to locate their graves on a map. 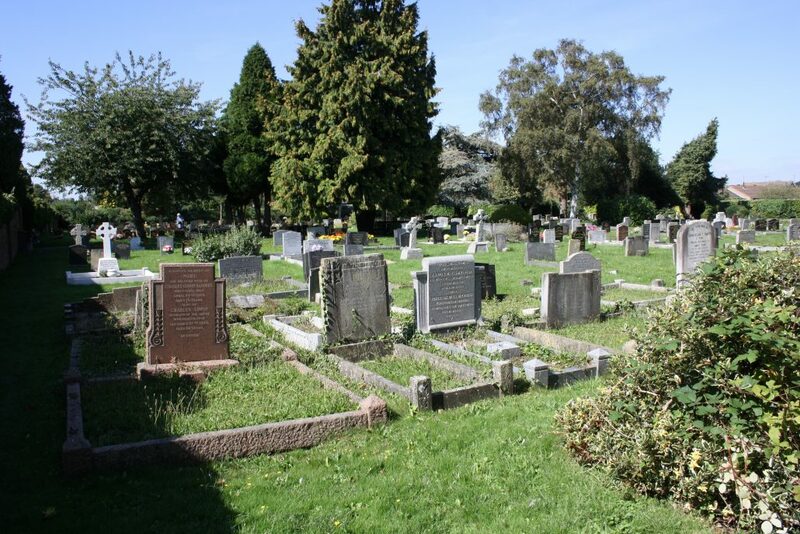 It can even be accessed from a smartphone so users can search the cemetery records whilst visiting the cemetery. So far, since being set up there has been an average of 29 requests a day and over 120 unique users. 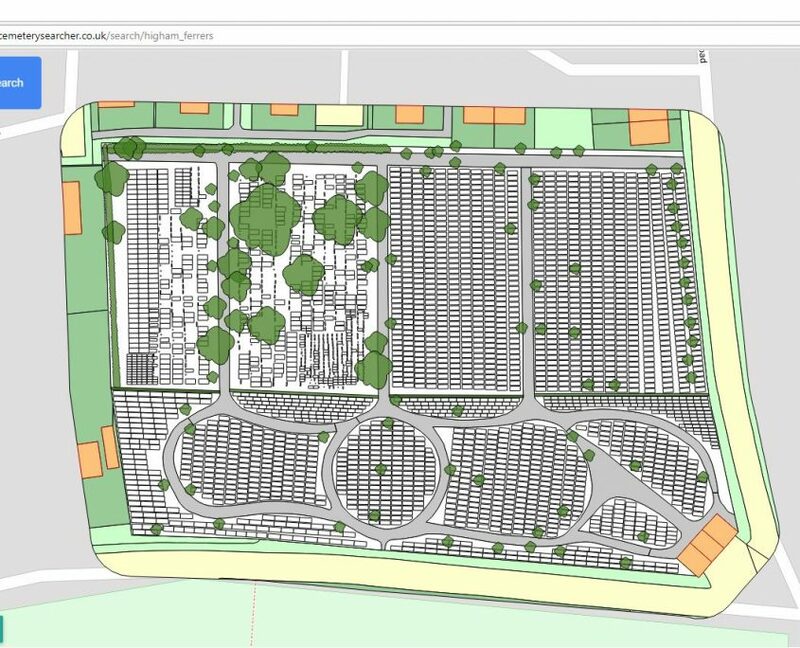 Because Pear Technology also provide mapping software and services to the arboricultural sector when a tree survey was carried out using a GPS device the position of 88 trees could be imported effortlessly onto the cemetery map. Sharing map data between council and contractor means arborists can pass these savings on to the council. 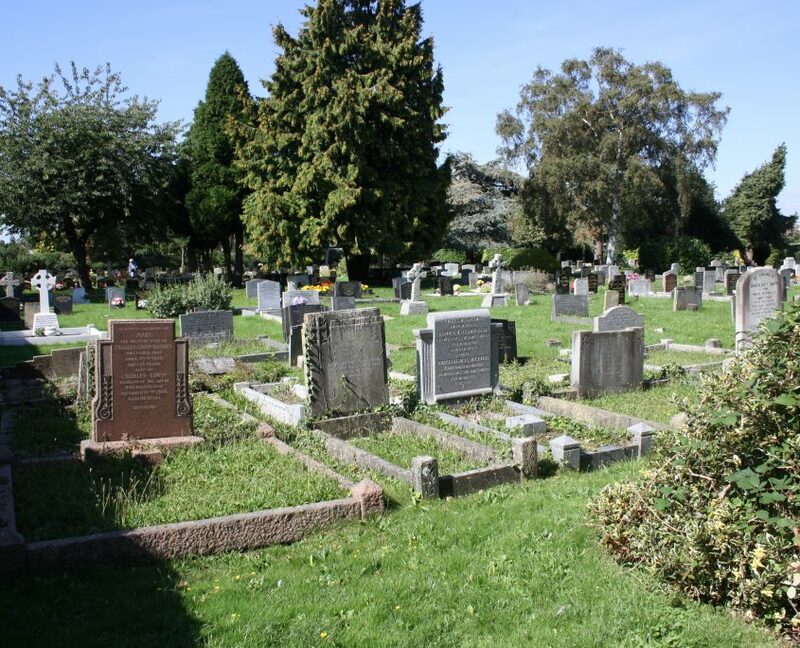 Using Cemetery Searcher or the Cemetery Database it now takes only 5 minutes to locate a grave using the cemetery mapping system compared to 45 minutes searching the paper records. 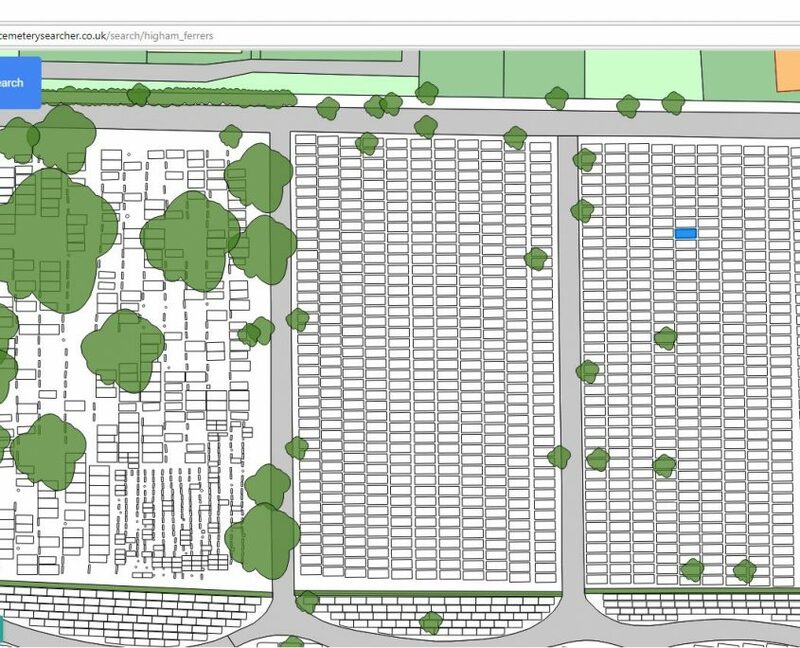 Maps showing the location of the grave can be quickly and easily printed off which is particularly useful for sharing plot location information with ground staff. 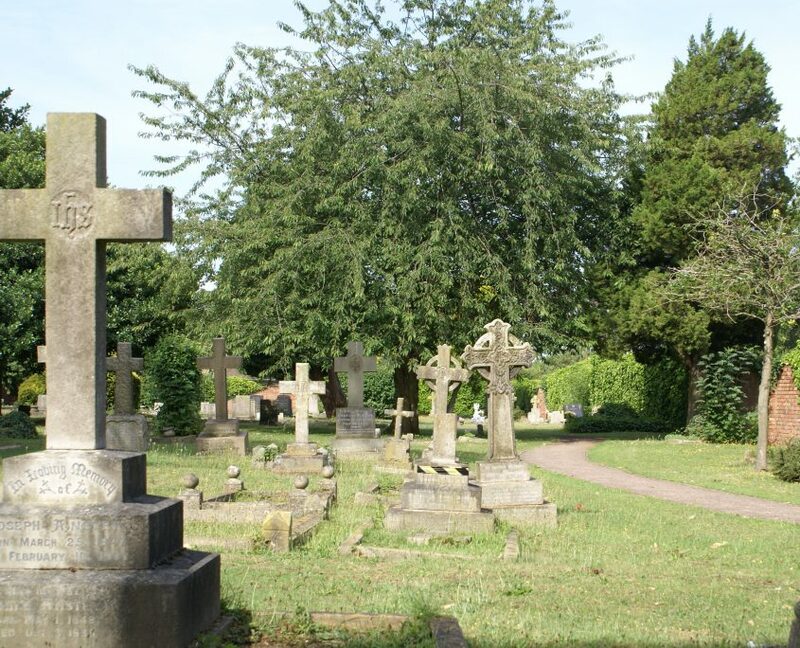 Cemetery Searcher also means that the public can now access and search the burial records themselves at any time of the day. PT-Mapper Pro has also been used for mapping events and asset locations. 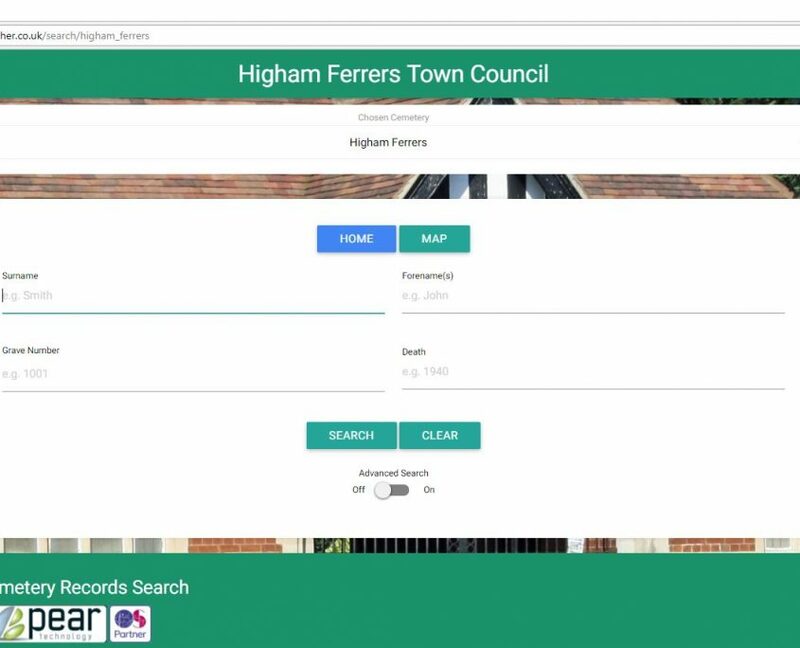 Higham Ferrers Town Council worked with a company who used PT-Mapper Pro to map and register the council owned land. Areas of land are linked in PT-MapLink to the Land Registry title plans and summaries of the title deeds. The council now have a digital mapping system that can be used to create town maps and plot and locate areas of importance of a map. Finally, Sandra plans to continue populating the burial database, adding backdated burial records to complete the transfer of all paper records to the database. 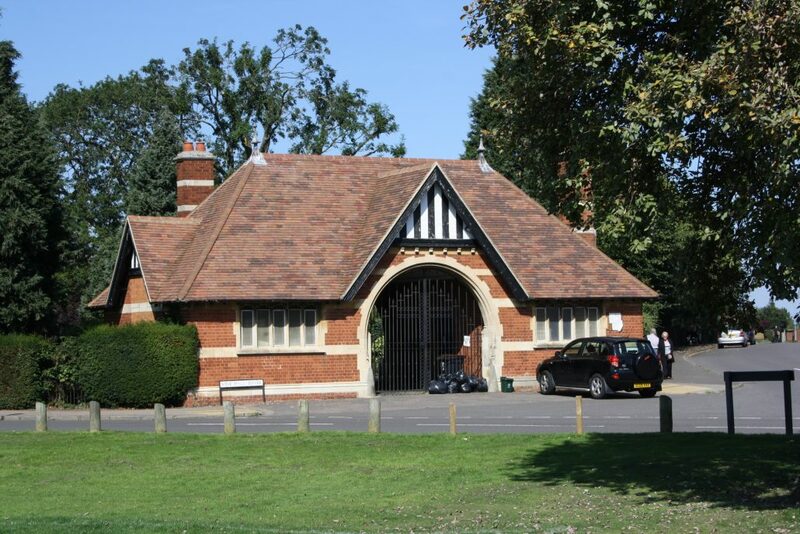 The council is also adding results of memorial surveys to the database to help follow up on any issues that arise. Pear’s technical support and software updates service means that the Council can rely on having the most up to date software and can access support when needed.